I wanted to make some cute baskets for Easter, so I started on this project. I fell in love with the end results and just could not wait until Easter to show you this! The possibilities with this are endless. I was thinking they would be cute inexpensive teacher gifts, baby shower gifts, bookshelf storage, kid’s room storage, or bathroom countertop storage. You can pick any colors combinations and fill them with just about anything! This is such an easy and forgiving craft. This would be great to do with kids too! Go wild, dear reader, go wild! Plastic basket with holes in it – I found all kinds of sizes, shapes, and colors at the Dollar Store! 1. 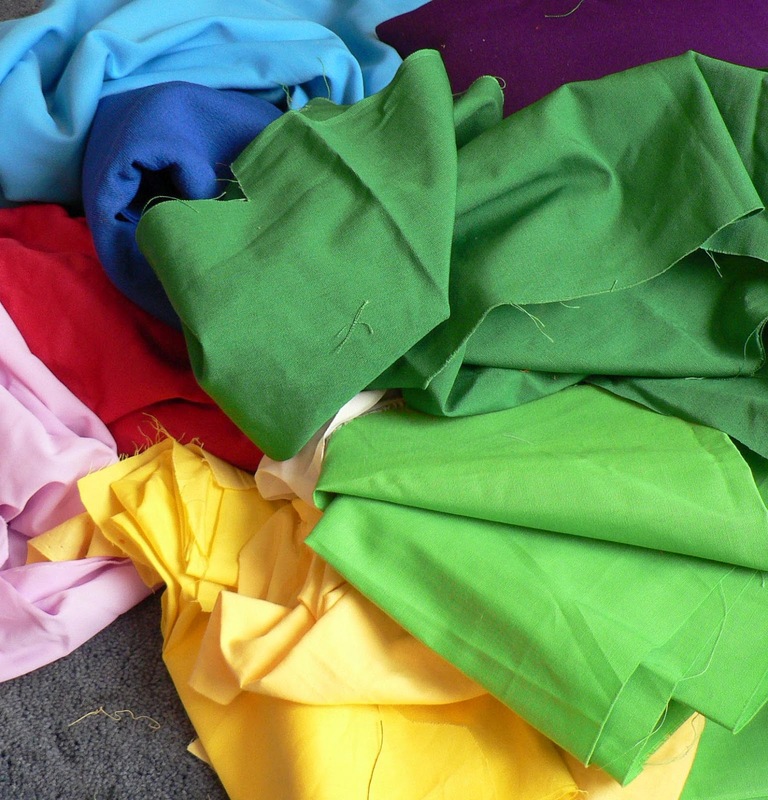 Start by collecting your fabric. Tear or cut the fabric into 1 to 1.5 inch wide strips. The length of the strips can vary, depending on how many times around the basket you want each color of fabric to go. 2. 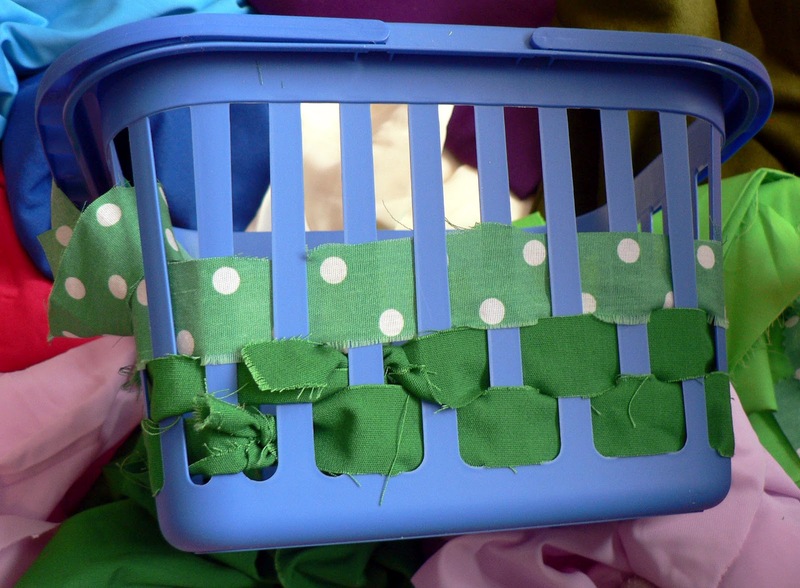 Tie your first scrap of fabric in a knot around the bottom of one of the plastic basket parts. 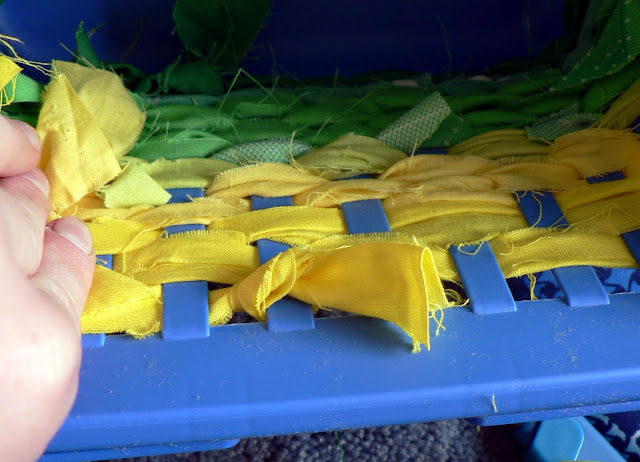 Weave the fabric in and out of the plastic parts. 3. When you are ready to add a new strip of scrap fabric, just tie it on to the fabric you were weaving. 4. Continue weaving the scrap fabric in and out of the plastic basket. 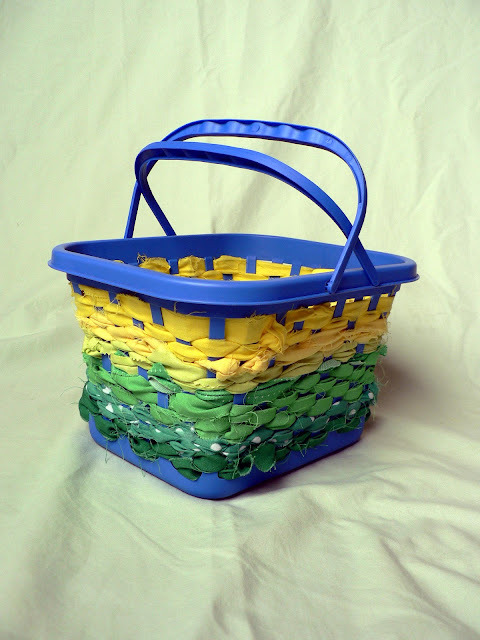 The basket will look best if you alternate between over and under on each plastic strip. 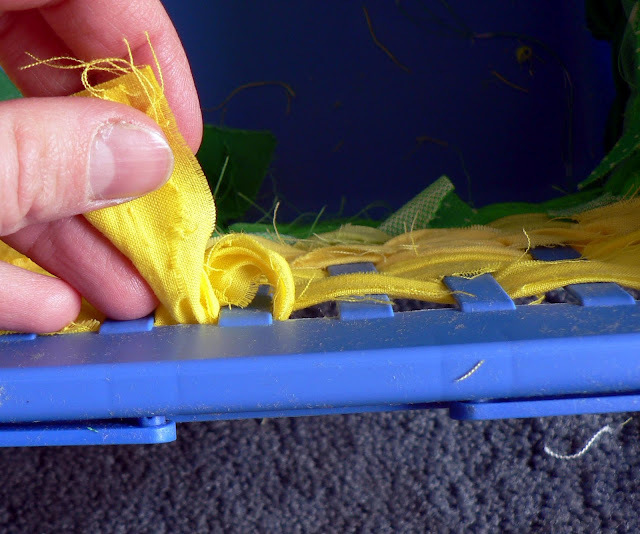 If you need get messed up, skip 2 plastic strips to get back on track – you’ll never notice where you jump to. 5. Every so often, squish the fabric down to keep it tight and continue on your merry way. 6. 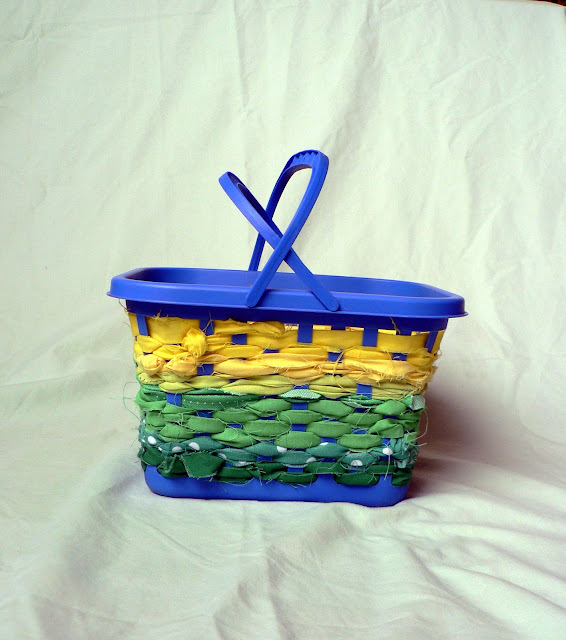 Keep weaving, tying one fabric, and squishing until you have a basket you love! 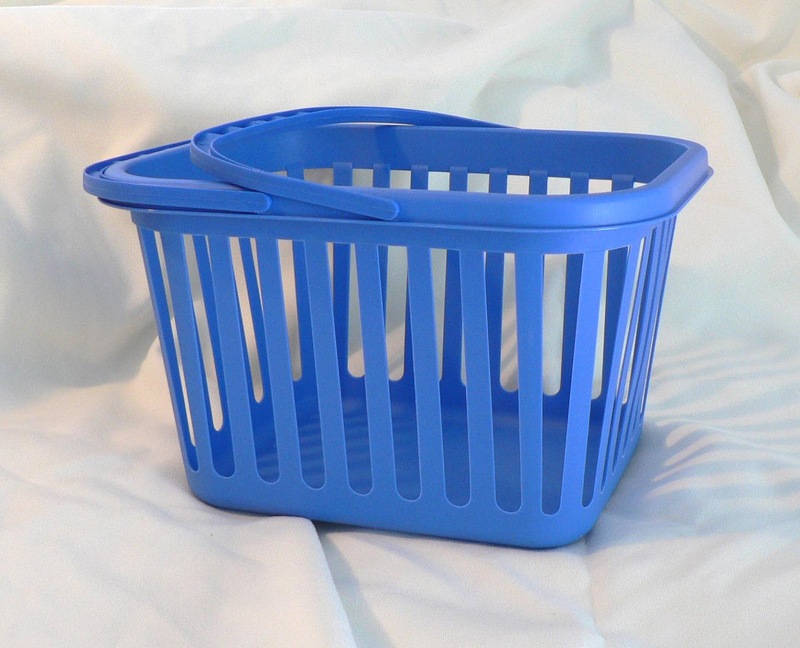 If you want to see the basket underneath, don’t squish so hard and vise versa if you don’t want to see much of the basket underneath. 7. 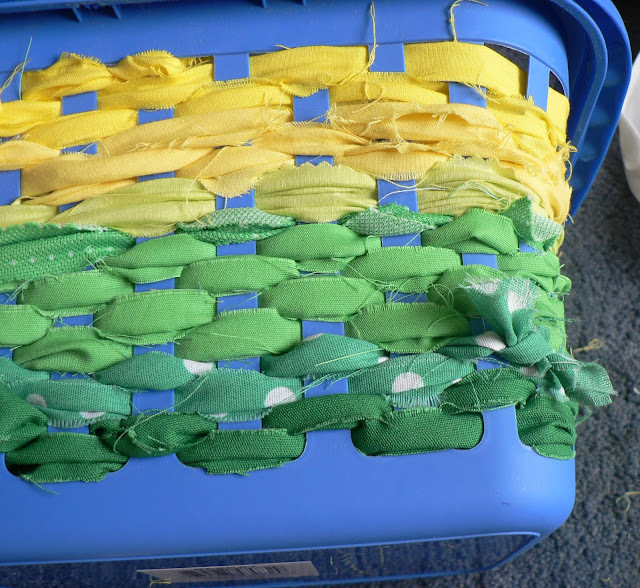 When you are done weaving, tie the scrap fabric off to the inside of the basket by making a loop in the fabric and pulling the tale through. 8. Now use it! Fill it with hair things for the bathroom, school supplies for a teacher gift, or fruit for your countertop! I’m serious. The possibilities are endless! This is such an easy way to add the perfect touch of color to a room. Go ahead, use up those scraps from the baby quilt project, and if you aren’t a sewer you could use old sheets or t-shirts! Now, I made this basket for my little boy. 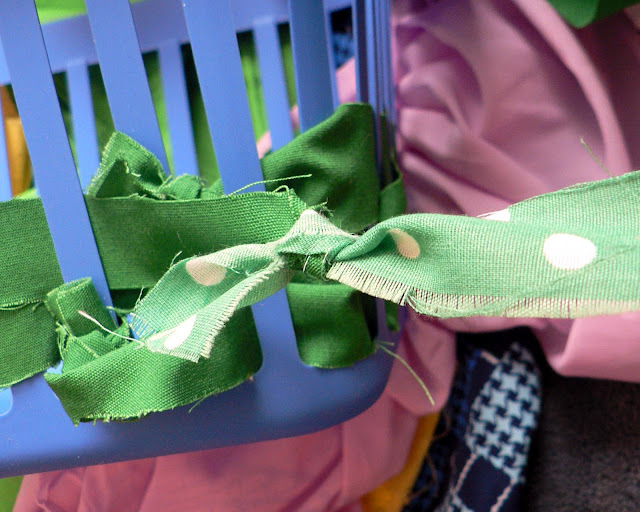 I thought the tied knots (where 2 strips of fabric were tied together) looked like bows. Bows are girly. 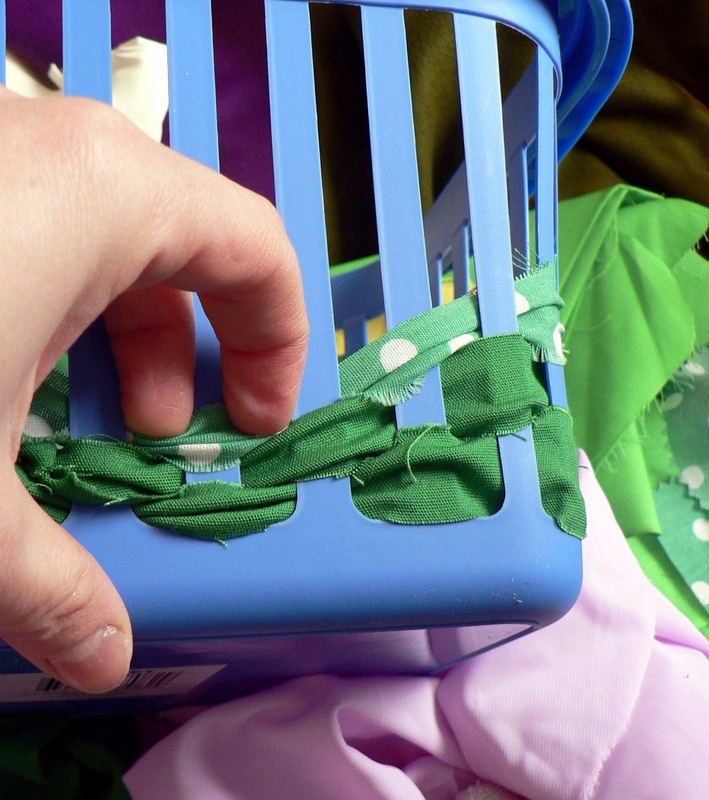 I made an effort to tie my fabric together on the inside of the basket to keep the knot/bows mostly inside; less girly. Love it! That is SO cute! I am excited to try it with Jonas. Oh! I am sooo doing this with my grandchildren for Easter! Thanks so much for spreading the word! I feel like I have some fun ideas but need help “getting them out there”. So thanks! i love this idea! I think Christopher would enjoy making his own Easter basket too! So great! 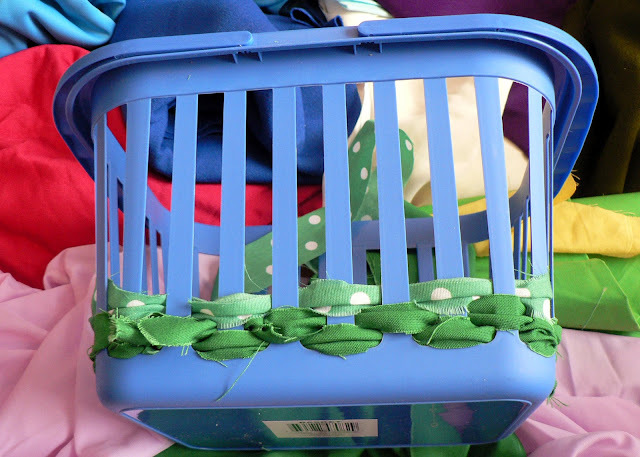 I just made some of these tonight for my girls using $.99 t-shirts from the local Goodwill and a few baskets from the Dollar Tree. By the way, I grew up with two parents that remodeled our homes for most of my childhood. The first home didn’t even have an indoor bathroom when we first moved in! My dad had to convert a closet. So, I can relate to your current lifestyle. I was 13 before we had a completed home (and 5 when we started). Hang in there! 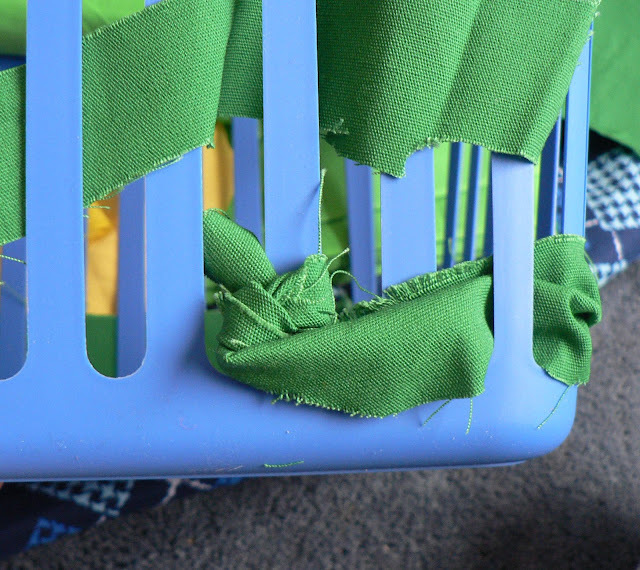 You’re giving your children invaluable lessons in handiwork. Believe me, they’ll be thankful for it all when they grow up and have their own homes to take care of. I really enjoy your blog!